An entire city block of historic architecture is up for rezoning and demolition, and will be debated at a City Council Livable Communities hearing this afternoon at City Hall. Student housing conglomerate Uptown Properties has proposed a new 72-unit student housing project in the Corryville neighborhood, located on the east side of University of Cincinnati’s campus. This comes on the heels of the 120-unit 65 West student apartment complex being constructed on the former Friar’s Club location at the corner of Ohio and McMillan Streets in Clifton Heights. At first glance, the proposal seems feasible, but in order for the project to be completed, the block of 7 historic properties on Euclid Avenue would be razed to the ground. Many community members and preservationists feel that removing the structures would be a short sighted move for a city that is so rapidly losing its historic urban fabric due to demolishing buildings instead of restoring them. 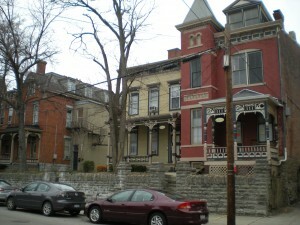 The Corryville neighborhood has lost over half its housing stock to expansions from the local hospitals and the University of Cincinnati. The current buildings are single family homes all built around the same time during the late 19th century in a Victorian style. According to residents, the block is one of the most beautiful and well preserved examples of Victorian architecture in the community. Uptown Properties has a history of converting historic buildings into student housing, yet its more recent projects have a bland, “value-engineered” look to them. Neil Clingerman, a recent University of Cincinnati grad and former Cincinnati resident, has helped to virtually lead the charge in bringing attention to the potential demolitions. Experts have estimated the new construction could cost potential renters up to twice as much for rent costs, which will drive out low income and student renters who are already struggling with tuition costs. The PLAN Cincinnati Housing Market Study document that current Council members should be familiar with outlines the situation for renters in the area: “The city’s renters experienced a loss of purchasing power during the past decade, as the median rent rose while their incomes declined. In addition, the city lost 7,847 assisted units (vouchers and public housing properties) between 2000 and 2010, making very affordable rentals even more difficult to find.” This information makes tearing down good buildings in order to build more expensive ones with less character hard to justify. The Livable Communities committee of City Council will be meeting today in the council chambers of City Hall at 801 Plum Street in room 300. The meeting is from 2pm-5pm, but the item is second on the agenda and will more than likely be addressed around 2.30 pm. Community members are encouraging those interested to show their support by attending the meeting or writing an email in support of saving the properties to City Council members. Euclid Avenue photograph provided by Danny Klingler.